An uncomfortable feeling strikes me for the first time. I fall, despite holding tightly to my rappel rope. An uncomfortable feeling strikes me for the first time. I fall, despite holding tightly to my rappel rope. “What the F*** just happened?” I wonder, as I emerge and signal that I’m OK to my teammates. Did the rope cut? Did the rigging system fail? Did the anchor give in? The short, 2m drop into the thankfully-deep pool below has caused no physical damage, although my mental state is affected by the episode: a poorly-closed quicklink had failed under the stress of my body weight and forces generated during my rappel. We check the anchor, and it’s solid. The team fixes another maillon, now triple-checking for its correct placement. We all agree it was a lesson better learned in the short, 7m waterfall rather than the following 90m single pitch monster of Lennox Falls. This year’s NZ summer was to become a tough one to swallow. Constant rain, wind, and the occasional snowfall directly affected our plans to knock down some long-overdue projects. With some even mentioning it was the worst summer they had seen in decades, it seemed unlikely that we could nail a big first descent this season. Until comes late February, early March and with that a fantastic spell of good weather. 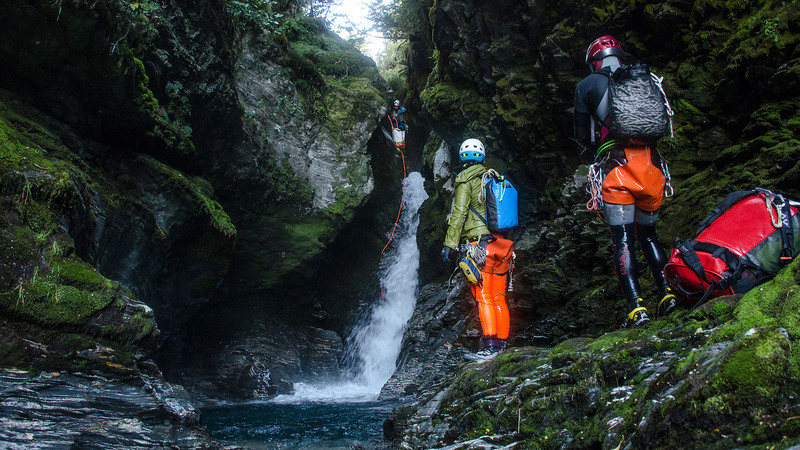 On March 2nd I get a text from Jasmine Li, one of my teammates from the Taiwan Canyoning Expedition: “We are arriving in Queenstown tomorrow, let’s meet?” it read. Jasmine, a Taiwanese sawanobori (shower climber), played a key role in the success of our expedition’s planning and logistics, and is one of the most determined canyoneers I’ve met. 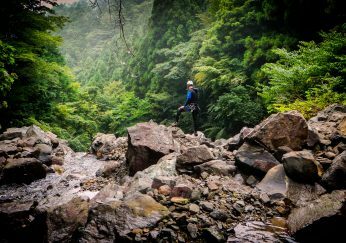 She was joined by Ryoji Onishi, also a TCE member, and an extremely accomplished Japanese climber, sawanobori & now, canyoneer. 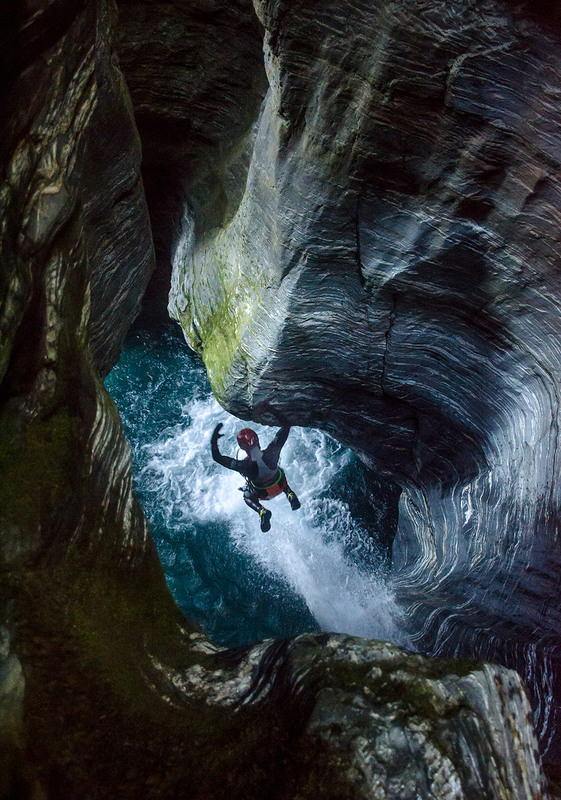 Gus Schiavon is fully committed to the documentation of canyoning: his experience working in the challenging canyon environment have allowed him to participate in many high-profile expeditions around the globe. 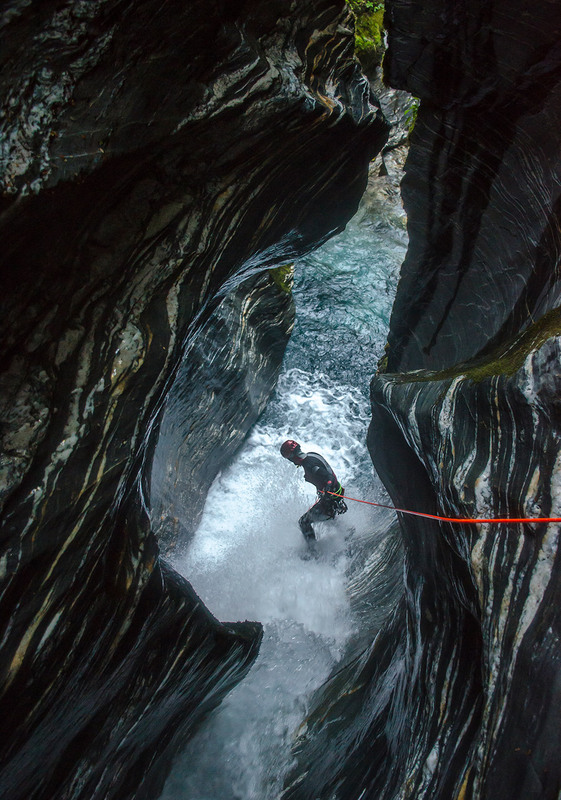 Gus is an ICOpro Instructor Photographer and teaches canyoning photography training courses. 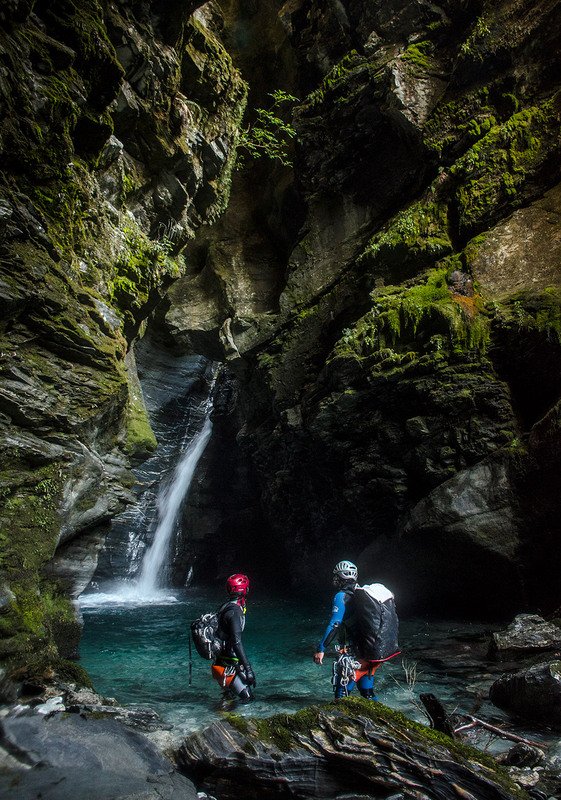 Surrounded by crowds of tourists & backpackers, we drink beers in one of the many Queenstown bars and they tell me about their recent 14-day self-supported canyoning exploration of Qia Kan in Taiwan, the longest on record. “But what’s your plan in New Zealand?” I ask, sure that they have studied every single valley and topographic map available and are full of planned missions. The question backfires: “What is YOUR plan in New Zealand?” Jasmine asks. Immediately, the answer pops to my mind: Lennox Creek. 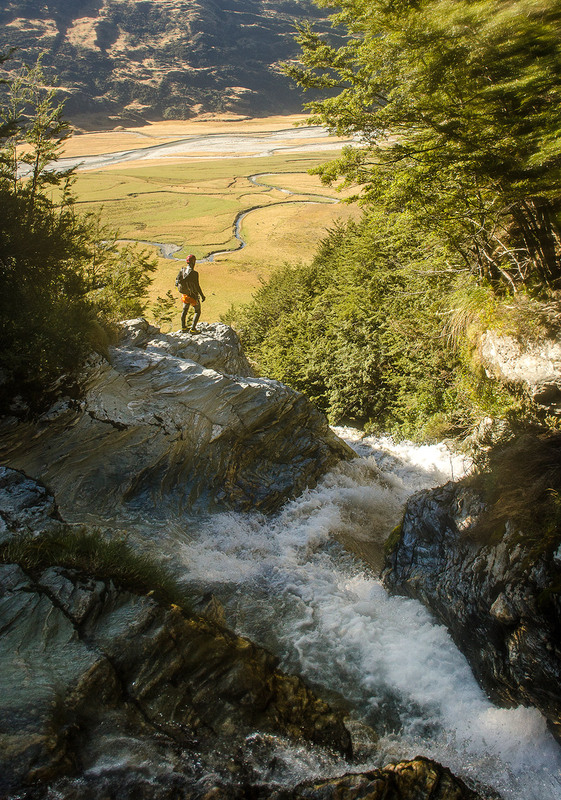 Lennox Creek is not remote neither is it hidden: Lennox Falls is clearly visible from the 25 Mile Creek Bridge at the Rees-Dart Track, and its 175m prominence is a familiar sight for Mount Earnslaw climbers or trampers accessing Kea Basin. The deterrent for many canyon explorers, in this case, is the east-facing Birley Glacier which directly flushed down Black Peak and into a narrow gorge. A recipe for cold, plentiful glacial water. I show them the topography and scouting information provided by my good friend Ben Buchy, who together with myself and a few others explored the epic Bedford Stream in the Dart Valley, on March 2015. Ryoji and Jasmine get excited with the prospect of yet another deep gorge to explore; we agree the timing is perfect, with good weather and all the necessary resources for the descent. We fix the dates for the 8th and 9th of March. 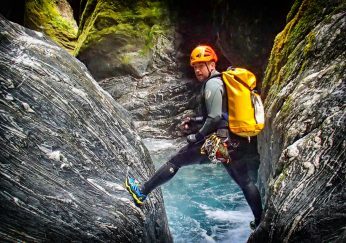 They decide to experience the canyoning classics at the Haast Pass, while I remain in charge of the organisation of a team & logistics for the following week’s mission. 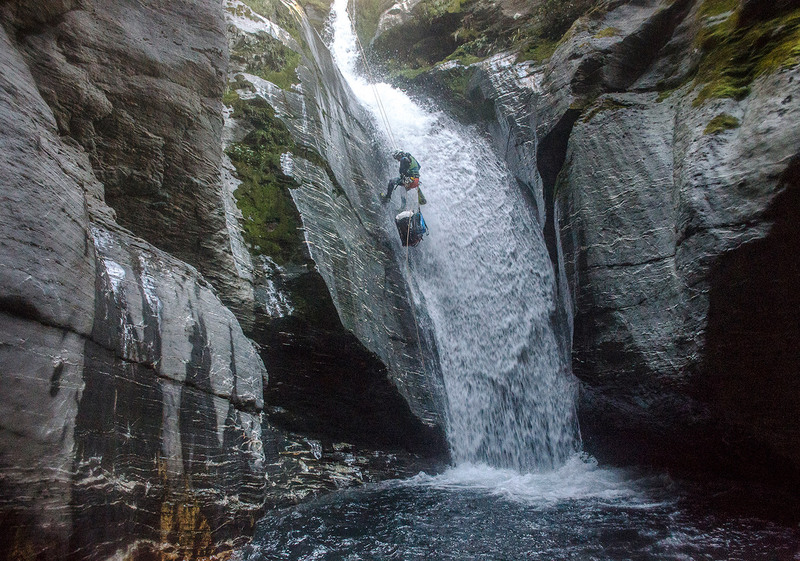 Canyoning first descents – especially for those big streams – require a good mix of some essential elements: first, a skilled team with a strong mindset; second, streamlined dynamics of in-canyon progression; third, adequate equipment and preparation and finally, a good weather forecast. With a beautiful window of sunny, clear skies coming in, we assemble the team of 5 including Noboyuki “Jumbo” Sekine and Hitoshi Tsunoi, both my colleagues at work and highly competent canyoneers. We prepare the equipment and purchase extra gear for the descent; I get the felling that it’s finally happening. Lennox Creek, after 3 years of expectations, was about to become a reality. Wednesday afternoon, we set-off to the Rees Valley. Our vehicles are suitable enough to cross some small streams and conquer often-impassable Muddy Creek, but their off-road capabilities are soon limited against the Rees River. 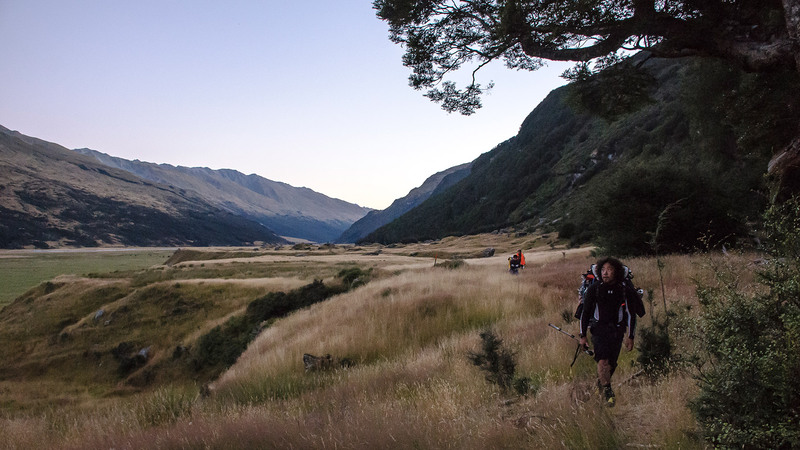 We park them at the river bank and walk the remaining 5km until the start of Kea Basin track; night falls as we decide to camp at the trailhead and avoid carrying our overnight gear through the canyon. We were to recover it after the descent was over. The still and clear night is majestic, the stars shined bright and the moon illuminated the valley floor, its light transforming the Rees into a silver, winding line. Jumbo and I make a trip to the stream to collect water for cooking. The noise of Lennox Falls thundering through the gorge above us is deeply recorded in my mind and echoes itself in that night’s dreams. With a 4am wake-up call, we reset camp and start the 1h15min walk up to Kea Basin, located at roughly 1,000m, at 5.20am. The plan was to be at the put-in point at 7.30am. The track is straight forward even during the night, and we quickly arrive at the basin. An easy bushwhack follows the tributary stream that feeds our canyon, and it’s not long until we arrive at the 820m start point. As the first of the day’s light starts to hit Birley Glacier, the clock starts ticking. Time is 7.45am. Glacier-fed canyons are usually better tackled during colder autumn days or sometimes, only to be attempted during the winter. The variation of water level through the day can result in easy passages becoming difficult and dangerous, especially in deep, enclosed sections. It takes time to establish exactly how much more water would run through the canyon, requiring multiple scouting days just sitting and observing. The east-facing Birley Glacier would see the sun from the break of dawn. An early, alpine start was our plan to avoid this flow fluctuation and overcome the first gorge, of approximately 500m in length. We gear up and are soon on the way, starting minutes after 8am. 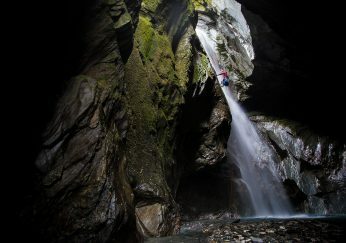 The first drop – a 8m waterfall – leads into a deep section. Using our bodies as meat anchor, we lower Ryoji so he can check if the pool below is deep enough to jump. With his hands flat and waving from side to side, we acknowledge that it’s just deep enough for a jump from the lower lip, about 6m high. The team follows suit, to a point of no return. 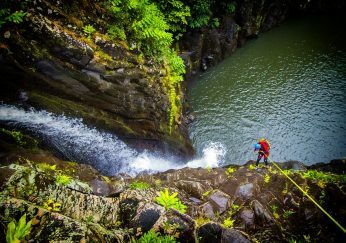 An easy climb on the right side of the pool gets us to the edge of a 20m drop into the gorge; the subsequent section cannot be spotted. We’re in and Lennox is on. 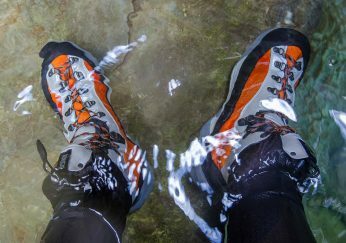 The rock quality is superb and extremely polished, providing perfect grip for our canyoning shoes; it reminds me of Bedford and its quartz-layered walls. The water flow is perfect for the exploration: not too challenging but enough to provide us with exciting moments. 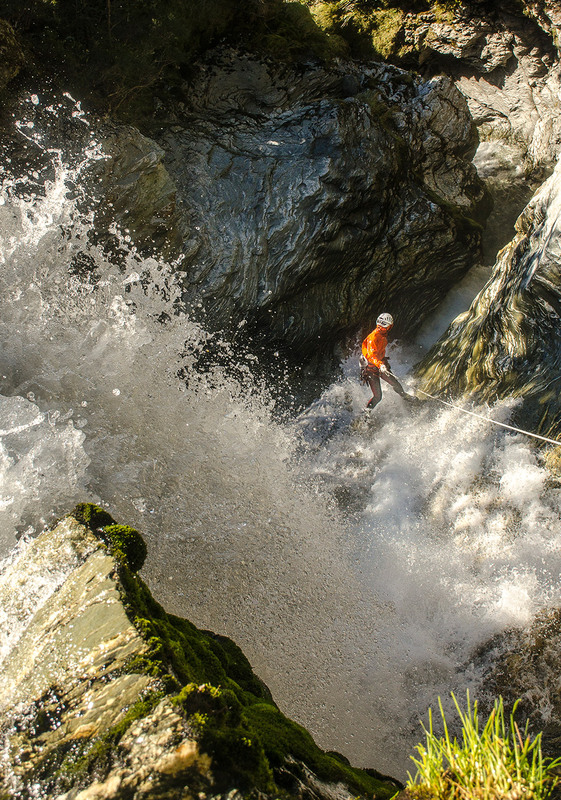 Deep pools allow us to jump in many of the gorge’s drops, speeding up the descent. 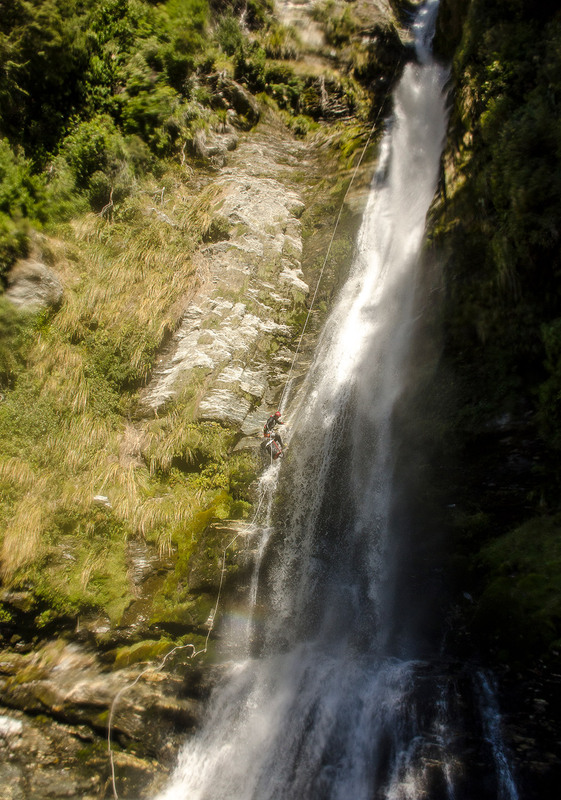 We quickly lose 60m of altitude, having only had to equip 2 waterfalls for rappel. We arrive at what seems to be the end of the first section, a 7m waterfall. A narrow reception pool is foaming with whitewater, making it difficult to judge its depth for a jump. Ryoji places an anchor and rappels first, with no issues. I’m next in line. 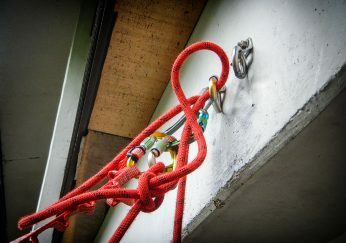 I equip my descender, take in the slack and start the rappel. At about 5m, I suddenly fall. The 2m drop happens without major consequences, I signal that I’m OK but immediately wonder what had happened. My first thought is that the rope had cut against the rock. Jumbo, still at the top of the waterfall, yells out the verdict: the quicklink used to thread the rope through had failed due to being poorly screwed, greatly reducing its breaking strength. The lack of shock means the actual anchor was still in good shape, so the team changes the set-up and descends. I’m mentally shaken by the episode: my carelessness in checking the anchor set-up before descending had me learn a hard-yet-thankfully-harmless lesson. First descents are intense and rewarding, but also involve serious consequences due to the unknown terrain that lies ahead. Issues like drill malfunctions, stuck ropes, loss of equipment and even worse, injuries like twisted ankles or broken limbs can result in difficult and lengthy rescue scenarios, often involving improvised emergency bivouacs in the canyon. I was angry that I had put myself and my teammates at risk by not thoroughly checking the gear before charging down. The set-back is soon offset by the start of the lower section of the canyon, on which the big verticals were to be the show-stoppers. “Let’s just make sure we triple-check the anchor set-up this time, fellas!” I jokingly-but-meaningfully state. A short and easy down climb leads us to the top of a 40m waterfall. The sun shines into the canyon and the Rees Valley is now visible from above. 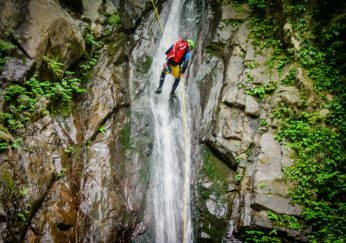 We analyse if the rope would pull through while rappelling the full length of the waterfall in a single pitch; careful management of rope rubbing for our technical 8mm BlueWater rope was also required. 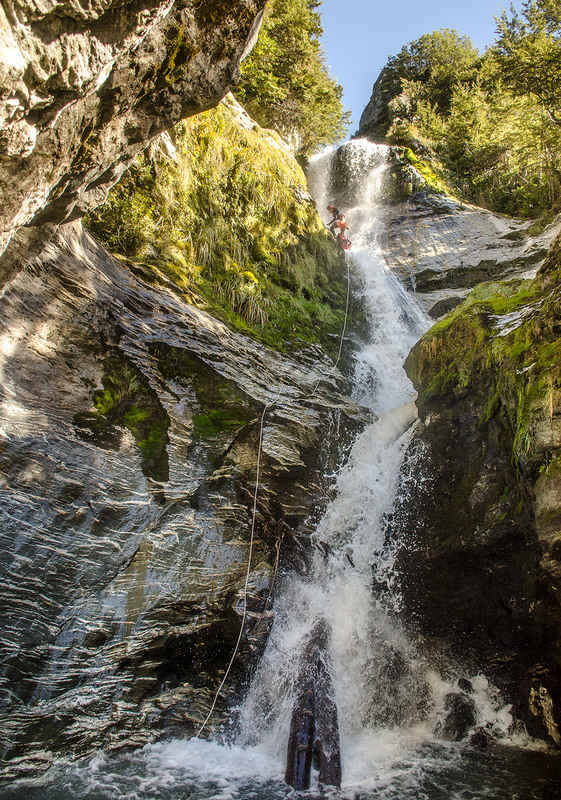 Another short 10m rappel leads to the top of Lennox Falls and its 175 meters. The epic setting has all of us excited for the upcoming sequence: from the top, we estimate the first pitch to be approximately 100m. Ryoji leads the way while I lower him until approximately 40m, reaching an edge from where he could see the bottom. Stopping for a second, we use our radios to discuss if a re-belay would be required for the remaining length of the drop. Tapping his helmet with a closed fist, he signals to continue the descent, judging the height to be less than what we had estimated. The rope goes slack and we hear his faint whistle twice; he’s down and OK. The markings on the rope indicate a 90m drop. The following radio chat, this time in Japanese, mentions a dry arrival at the bottom of the falls. We prepare the system to allow easy releasing in case of emergency. 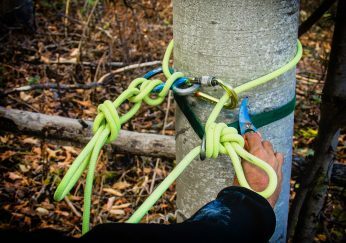 The joining knots are put on one side of the maillon while a releasable system is set-up on the opposite side, to both manage the rope rubbing and assistance in case of emergency. 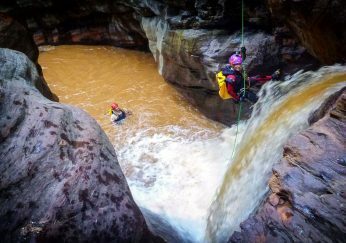 The rappel is smooth and we play around by jumping across the flow while maintaining a good, safe trajectory. The 40m edge provides a spectacular view: the waterfall shoots out and forms a rooster’s tail, the remaining 50m still below. I smile and make a mental tribute to our friend Ben Buchy: he would have been completely thrilled to explore this canyon, and we agree to name this rappel the “Buchy Pitch”. I climb out and around and marvel at what I’d had just done, while watching Hitoshi and Jumbo finish their descent. Not a single cloud is to be seen in the sky, the warm sun fills us with its energy. What a day for a first descent. The next 15m down climb takes us to the top of the last waterfall, its prominence springs to my mind from the previous year’s scouting trip. I check my watch and it shows 12pm: I’m stoked with the speed we have descended the previous 240m of the canyon. A quick anchor placement and we’re on the way, with the last of us finishing the 80m rappel at 12.40pm. High fives and smiles, we’re done. Lennox Creek is finally open. It is decided that the previous night’s campsite and its views of the Rees Valley are a perfect setting for lunch before heading back, despite the ridiculous amounts of annoying sandflies. Wetsuits are laid out to dry in order to lighten the load for the returning 1h30 walk. With all packed, we return towards our vehicles while looking back towards what we had done. Nothing could take the smile off our faces, but also our minds to what still lies beyond and unexplored in the Rees and Dart Valleys.